The most efficient method of increasing horsepower in an engine is by using a turbosupercharger or turbocharger. Installed on an engine, this booster uses the engine’s exhaust gases to drive an air compressor to increase the pressure of the air going into the engine through the carburetor or fuel injection system to boost power at higher altitude. The major disadvantage of the gear-driven supercharger––use of a large amount of the engine’s power output for the amount of power increase produced––is avoided with a turbocharger because turbochargers are powered by an engine’s exhaust gases. This means a turbocharger recovers energy from hot exhaust gases that would otherwise be lost. A second advantage of turbochargers over superchargers is the ability to maintain control over an engine’s rated sealevel horsepower from sea level up to the engine’s critical altitude. Critical altitude is the maximum altitude at which a turbocharged engine can produce its rated horsepower. Above the critical altitude, power output begins to decrease like it does for a normally aspirated engine. 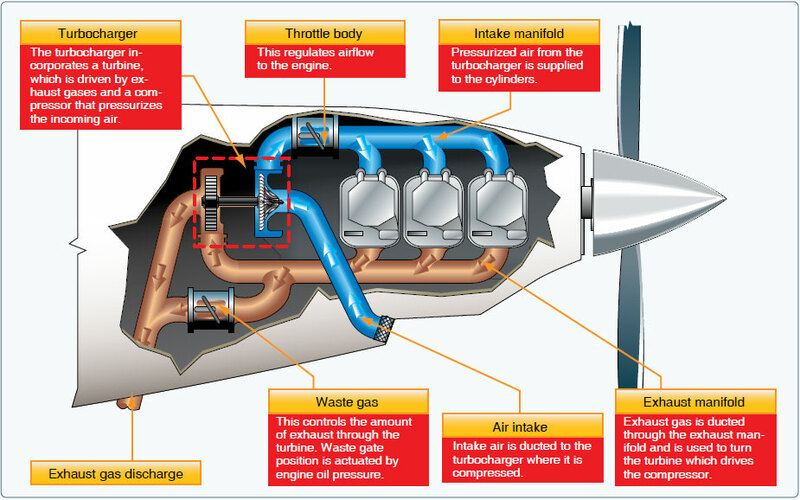 As an aircraft equipped with a turbocharging system climbs, the waste gate is gradually closed to maintain the maximum allowable manifold pressure. At some point, the waste gate is fully closed and further increases in altitude cause the manifold pressure to decrease. This is the critical altitude, which is established by the aircraft or engine manufacturer. When evaluating the performance of the turbocharging system, be aware that if the manifold pressure begins decreasing before the specified critical altitude, the engine and turbocharging system should be inspected by a qualified aviation maintenance technician (AMT) to verify that the system is operating properly.